Through crowdfunding efforts and the film and media incubator Big Vision Empty Wallet, as well as the industry connections of its collaborators, the locally-produced horror film Unearth has the budget and potential for national distribution. 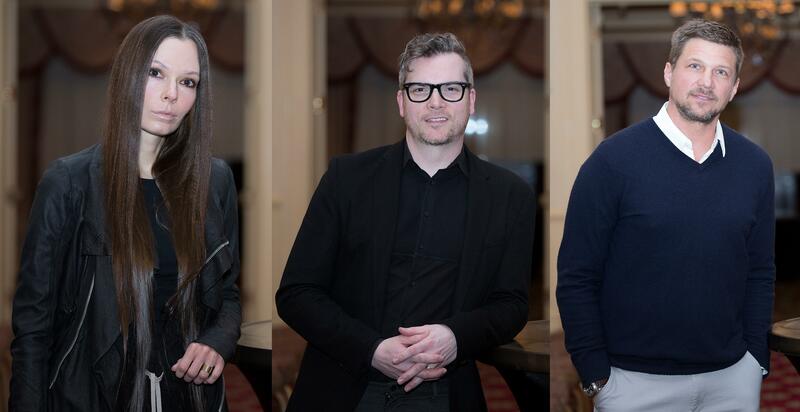 Pictured here (from left to right) are co-directors Dorota Swies and John C. Lyons along with actor Marc Blucas. Scary movies are shedding their schlocky reputation these days. Last year, director Jordan Peele found himself on the receiving end of near-universal acclaim (and an Academy Award) for Get Out, which offered a resonant indictment of white liberal racism through the lens of an old Twilight Zone episode. Two years prior, Robert Eggers' The Witch combined pseudo-satanic thrills with a unique glimpse of New England in the 1600s. Acclaimed arthouse directors like Lars Von Trier, Nicholas Winding Refn, and Claire Denis have all given the horror genre a shot recently. And the genre's momentum is about to come to Erie. Our city's upcoming contribution to the horror scene is called Unearth, and it's not your typical gore-fest. It tells the story of two families in rural Pennsylvania who find themselves at odds over a local fracking initiative. An ecological nightmare soon ensues, but the film is as concerned with psychology as it is with bloodshed. John C. Lyons and Dorota Swies, the film's co-directors and producers, have been on an ambitious mission to get Unearth into production for about two years. In 2016, they raised $21,000 through Kickstarter, hired a small team of professionals to shoot some early footage, and began looking for Hollywood talent. The script soon drew the attention of Marc Blucas, a Girard native most famous for his role as Riley Finn on Buffy the Vampire Slayer. Allison McAtee, an Edinboro native who has appeared on Showtime's Californication and Tyler Perry's The Haves and the Have Nots, quickly signed on as well. With two recognizable stars on board, Lyons and Swies headed to New York City, where they found support from a film and media incubator called Big Vision Empty Wallet. After attending a series of seminars with distributors and sales agents, they secured a letter of intent from Candy Factory Films. "The letter of intent states that Candy Factory is interested in releasing our film nationally and internationally. And that letter has a three-year offer," according to Lyons. The company has released dozens of independent features over the past several years, including 2015's The Midnight Swim, which was recently screened at the Erie Art Museum. After returning from New York, a partnership emerged with Tolin FX to facilitate the practical effects necessary for the project. Lyons describes the company as the "top effects house in Pittsburgh," and the projects on their resume bear that out. Tolin FX has designed physical props for The Dark Knight Rises, the Tom Cruise vehicle Jack Reacher, and Netflix's addictive drama series Mindhunter. On a local level, some of the digital effects will be provided by MoreFrames Animation in Erie. As you might guess, Unearth's budget grew in accordance with its ambitions. Thankfully, a team of twenty local investors have provided 82 percent of the film's total budget — enough to cover shooting costs in full, as well as part of post-production. Better still, stars Blucas and McAtee signed on as producers as well. Marc Blucas has experience working as a horror producer in the past (on 2011's post-apocalyptic feature The Day) — in addition to the years he spent slaying vampires. I asked him about his work in horror over email: "The genre allows for budgets to be controlled," he replied. "There are limited types of stories you can craft that still have a reasonable financial upside potential for investors. The horror genre generally is inexpensive to produce — or you can at least craft stories that can be made on a much smaller scale, such as people trapped in a house, or in the woods." Meet the filmmakers, entrepreneurs, innovators, and ex-vampire slayers putting Erie on the map. Allison McAtee signed on as a producer "to have more creative input into the characters and story." She soon convinced her producing partner in Los Angeles, Kelsey Goldberg, to share her thoughts and her industry perspective. "She, John, and I worked collaboratively in discussing all script details on a weekly call, and then the two of them took turns alternating with writing drafts," says McAtee. This focus on the story is especially important to co-director Dorota Swies, who wants to ensure that "there is a lot of story behind each character," and that "the motivation for each character and their process of thinking" is fundamental to the film's appeal. Edinboro native and actress Allison McAtee peers out from her porch in a still from the proof of concept/pre-filmed scenes for Unearth. McAtee was also able to use her industry connections to attract Lisa Zambetti, along with her team in Los Angeles, to come on board for casting. Zambetti serves as casting director for the long-running television show Criminal Minds, and has worked on big productions like Breaking Bad and Rise of the Planet of the Apes in the past. According to McAtee, "a casting person at her level is uncommon at our budget, so I think it speaks volumes for the story itself." The search for actors will occur at the national level as well as the local one. For the five most prominent roles, Zambetti and her team will focus primarily on Screen Actors Guild members. But the supporting roles will be sought out in Pennsylvania. "We're going to be announcing soon for casting calls in Erie and Pittsburgh for our supporting roles," says John Lyons. "So stay tuned for that." Although much of the film's action will take place on two rural farms, local cinephiles will be able to see some recognizable landmarks in the film. Lyons is especially excited to shoot some footage at the Crawford County Fair: "We're going to film a key conflict scene during the demolition derby." After receiving a warm response to their ideas from the fair's leadership, the scene will literally be shot as the cars begin crashing. Speaking of shooting, Unearth is set to begin production in late summer and Lyons and Swies are hoping to have the film completed by the end of the year. From there, they hope to shop it around to as many top-tier festivals as possible. The Senior Programmer at the Tribeca Film Festival in New York City has already expressed interest in the project. After reading the script for Unearth, author Chuck Palahniuk (of Fight Club fame) took to Twitter to praise it. And in February, one of the film's investors managed to get a copy to Karen Lawrence (whose daughter Jennifer has made some films you may have heard of) and she praised the film's well-developed characters. Actor and Girard native Marc Blucas is best known for his role as Riley Finn in the television series Buffy the Vampire Slayer. He will play the leading man in the upcoming film Unearth, which begins production this summer in Northwest Pennsylvania. With some hard work and a lot of luck, Unearth will help put Erie on the map for independent filmmaking. Marc Blucas is excited about the local momentum: "We all shared one common goal—which was to potentially inject a new industry into the area, to create some jobs and some excitement about something new. That if done right, could have some legs to continue beyond just this single film. This wouldn't be happening without them — people who have invested financially, but more importantly, emotionally." There are still a few kinks to work out on the path to completion. Lyons and Swies are still actively pursuing investors. Some peculiar needs still require fulfillment, like access to a rugged treehouse near Edinboro or Albion. Perhaps you can help? As I concluded my conversation with the film's two main actors, I asked them what they were looking forward to about returning to the region. Allison McAtee misses the "sweeping rainbows of color through the trees" during fall in Pennsylvania. Marc Blucas is especially excited about Romolo's chocolates: "I have traveled the world, and don't claim to know much, but I'll put Romolo's up against any chocolate, anywhere, anytime — and like my chances." It's that kind of intimate local connection that makes ambitious projects like Unearth worth supporting.